From the grow up! 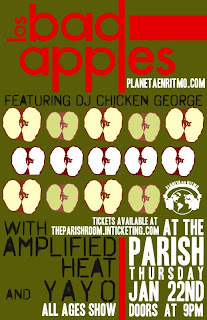 department... Help see Los Bad Apples off on their Middle East Tour for the Troops @ The Parish on Jan 22nd! With artists Amplified Heat, Yayo and DJ Chicken George! Go home Bush! Oh wait.